workshop as part of WUSC’s 61th Annual General Assembly. It's been a decade since UBC last had a referendum for the Student Refugee Program. So building on the success of our WUSC predessors, we look reflect back on the 1997 referendum, and look forward to an even more prosperous future for the SRP! In his native Rwanda, Willy Rangira lived in fear for four years. It was dangerous to venture out after dark in case he encountered soldiers or bands of Hutu men looking for a Tutsi such as himself. "I managed to survive the 1994 genocide," he says now, "but when it was over I had to leave my friends and family behind in search of a better future." He fled to Kenya, where he eked out an existence tutoring French and grew increasingly despondent about his life as a refugee. Now, thanks to a World University Service Canada (WUSC) program for refugee students, Rangira is studying first-year Arts at UBC. He is one of three students who have recently arrived at UBC under the program. The others are Milada Tanovic of Bosnia and Joseph Bartel of Sudan. "The challenge of adjusting to life in a new country is difficult for anyone," said Glen Peterson, assistant professor of History and the WUSC-UBC faculty adviser, "but it is often especially difficult for refugee students who have been forced to flee their home countries." "Most of the refugee students who have come to UBC have completed their degrees and gone on to meaningful careers. Some have earned master's degrees and PhDs," he added. This year UBC will welcome three new WUSC-sponsored students: Pascaline Nsekerabanyanka and Valery Kiyogama from Burundi and Huang Junfeng from China. WUSC is a non-profit, non-governmental organization dedicated to involving Canadians in international development in Canada and overseas. 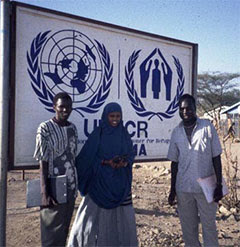 The UBC branch dates back to 1947 and has been sponsoring refugee students since 1981. In the past 16 years, 23 refugee students have studied at UBC. The student refugee sponsorship program is run entirely by UBC student volunteers who make up the local WUSC committee on campus. They arrange admission, housing and course registration for students before their arrival, and provide personal support throughout the year. 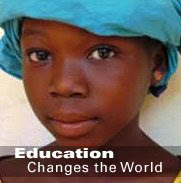 Sponsored students automatically become members of the local committee. WUSC's national executive director Marc Dolgin was recently on campus to sign a revised refugee student support agreement. The agreement includes increased funding from the Alma Mater Society and the Office of Awards and Financial Aid. Awards and Financial Aid provides a bursary for refugee students that this year was raised to include tuition fees and a book allowance for up to three students per year for the duration of their academic program. "This makes UBC the leading university in Canada for providing bursary support for refugee students," Peterson said. Last year, UBC students voted in a referendum to commit one dollar per student to the refugee program, doubling their earlier contribution. As well, the UBC Faculty Association provides an annual donation of $10,000 to support refugee student sponsorship and other WUSC activities on campus including book drives for needy universities abroad and overseas study opportunities for UBC students. Shine A Light event (October 9, 2009)! WUSC UBC has created a new best practices guide!